In 2017, Unit 42 reported on and analyzed a low-volume malware family called Cardinal RAT. This malware family had remained undetected for over two years and was delivered via a unique downloader named Carp Downloader. Since that publication, we have continued to monitor this threat, resulting in the discovery of a series of attacks using an updated version of Cardinal RAT. A series of modifications have been made to the RAT, many of which are used to evade detection and hinder analysis. The last time we wrote about Cardinal RAT in 2017, we looked at version 1.4 of the malware family. We identify this latest sample as version 1.7.2 based on information within the payload. 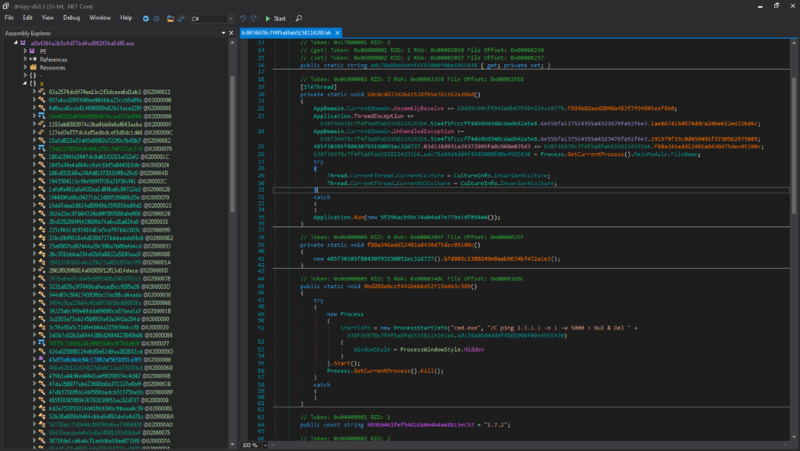 Unlike previously discussed samples, this latest instance of Cardinal RAT employs various obfuscation techniques to hinder analysis of the underlying code. The first layer of obfuscation comes in the form of steganography; the initial sample is compiled with .NET and contains an embedded bitmap (BMP) file. The command prompts the user for a choice with a 20 second timeout, at which point the process will exit. Since the window is hidden, and there is no utility for this choice, the malware simply uses this as an alternative sleep command. 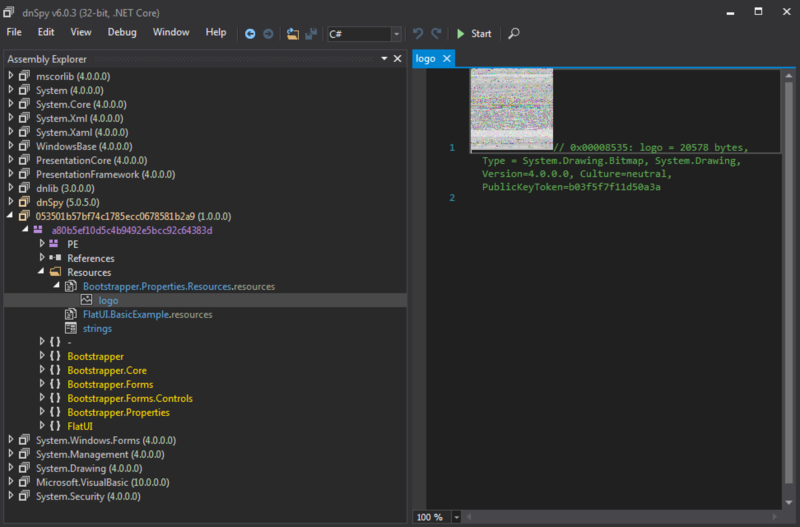 It then writes an embedded executable with the hash below to %TEMP%\[random].exe. This file has an internal filename of RunExecutive.exe and simply copies the contents of argument #2 to the file path specified in argument #1. Finally, the malware will execute the previously written RunExecutive executable with arguments to copy the original executable to the previously referenced sqlreader.exe file path. Underneath all this obfuscation, this Cardinal RAT payload does not have any significant changes compared to the previously discussed version in terms of its operation or capabilities. One of the most significant changes lies in the obfuscation used by the malware; all of the functions, methods, and variables have been renamed to MD5 hashes. In addition to the obfuscation routines in use, there have been a few minor changes within the malware itself. First, the embedded configuration has a few changes both in the order of the embedded values, as well as what values are present. Additionally, the way this configuration is encoded has changed slightly, as several values that were previously base 64 encoded in version 1.4 are no longer base64-encoded. When looking at files submitted by the same customer in a similar timeframe to the Cardinal RAT samples, we saw that the customer had also submitted a malware family we’d been tracking as EVILNUM. From our viewpoint this is another family that seems to be used solely in attacks against finance related organisations. 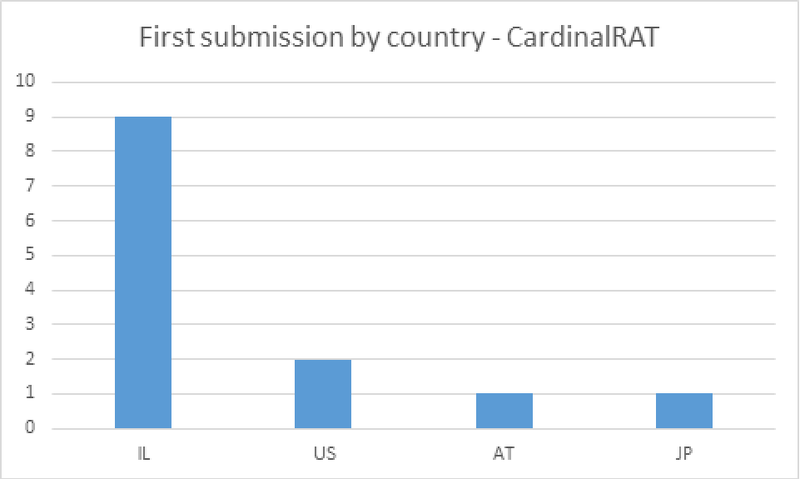 When we cross-referenced submissions to online sandboxes, we found an additional case to ours, where another organization had submitted both EVILNUM and Cardinal RAT on the same day; both of which are rare malware families with limited distribution. Despite the differences in programming language used, the samples are similar, and we believe the .NET edition is likely a rewrite of the .JS version. The malware appears to have been given a general rewrite, (as indicated by the authors’ version number) with many functions being rewritten from scratch. Despite this, the core functionality of the malware is mostly the same, and some of the concepts used in the malware family (such as the lock file) remain the same. It’s likely that the malware only serves as a first stage and the attackers deploy further tools to target networks of interest. Since April 2017, we have observed Cardinal RAT in attacks against two customers, both customers were FinTech companies who write software relating to forex and cryptocurrency trading, and both companies were based in Israel. Looking at submissions to VirusTotal, there are 13 Carp Downloader documents. Note that we are only looking at submissions for “entry” type files, not subsequent dropped files. When looking at the first submitters for these documents in Figure 1, we see they are predominantly uploaded from Israel. In the case of EVILNUM, we have only seen one instance at a customer (the same one we referred to earlier in this article). When it comes to investigations from public sandboxes though, the distribution of the initial files used in infections is most commonly via LNK files. 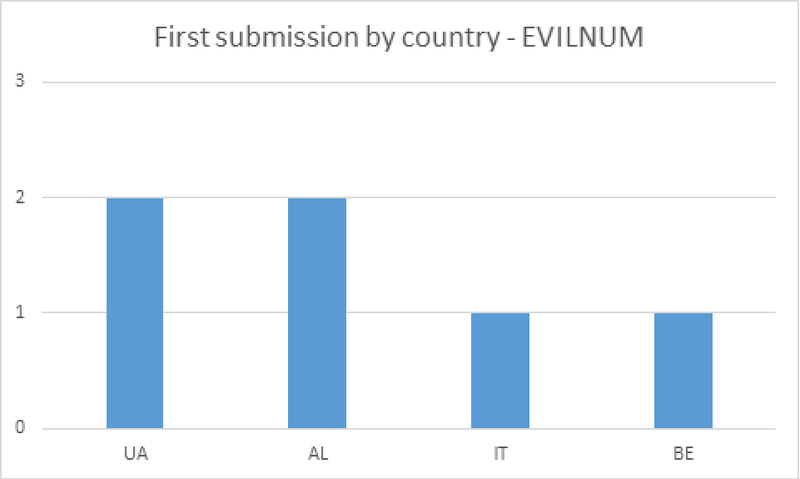 The geographical distribution of first submitters for EVILNUM is quite different, as shown in Figure 4. Cardinal RAT and EVILNUM are both used in limited distribution attacks against FinTech companies. In one case, both families were observed at the same target in a short space of time, whilst droppers for both families share similarly themed lure documents. Our telemetry shows these families are only used against companies in this sector. The lure documents used consistently related to lists of names/numbers of individuals involved in trading forex/crypto currency, a niche theme to use if targeting individuals outside of this sector. We know of two cases where a company was targeted or appears to have been targeted by both malware families in short succession. Both families have been distributed using malicious documents containing lists of names/numbers of individuals involved in trading forex/crypto currency. The differences in geographical distribution can be easily explained as a difference in visibility. In terms of the geographic spread of where these families are seen, the targeting for each family seems to be quite different. The delivery methods for each family do not share any similarities. The infrastructure associated with each malware family is distinctive and different with no cross-over in terms of hosting providers or other attributes being observed. Even if the two families are not linked, they both have similar targeting interests, and so FinTech organisations should ensure they are protected against the malware used. Whilst we haven’t been able to gain an insight into what the attackers do once successfully on a target network, it’s likely (based on the targets) they use their access to facilitate financial gain. Do not allow inbound e-mails with LNK file as attachments, or, do not allow inbound e-mails with attached ZIP files containing a single LNK file inside them. Do not allow inbound e-mails from external sources where the documents contain macros, or, if you do, ensure proper policy is configured. Enforce parent-child process policies to restrict use of scripting languages by malware. EVILNUM variants are blocked by our IPS, see threat IDs 18781 and 18782. Wildfire and Traps detect all files referenced as malware. AutoFocus users can track this activity using the CardinalRAT, CarpDownloader and EVILNUM tags.